Andrea P. Leers FAIA, Jury Chair: "Showing a skillful rigor, the measure of windows become a datum, with the windows and panels of the same module. The custom furniture and millwork reinforce the continuity of the space. The project is rigorous in concept, being both a good strong idea and a refined execution of that idea." Enrique Norten FAIA, Jury Chair: "The jurors were impressed with how the design integrated clear horizontal and vertical geometries along with a restrained but beautiful material palette to achieve a decisive and rich solution for this urban townhouse." Enrique Norten FAIA, Jury Chair: "The proposal successfully defines the new spaces of three distinct programs - café, optical store and pharmacy with a simple and elegant design that clearly work together and offer surprising warmth and a sense of lightness despite two of the spaces having no direct sunlight." 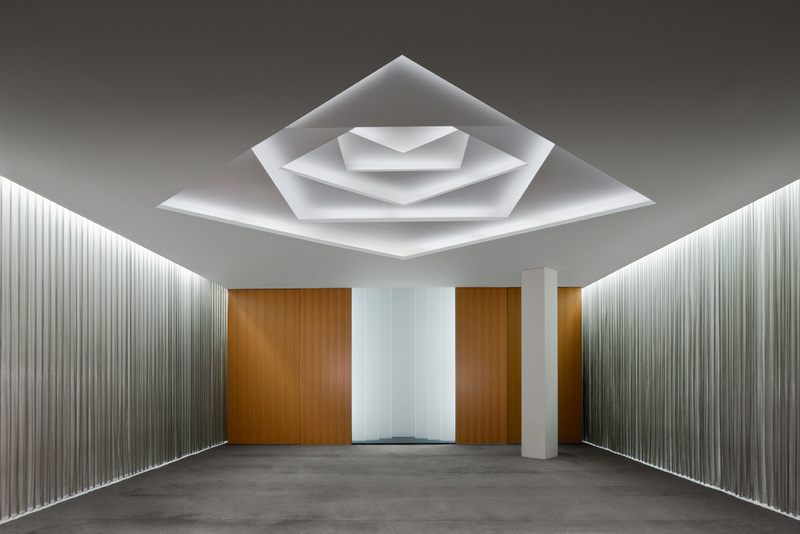 Ralph Johnson, FAIA of Perkins + Will, Jury Chair: "A simple elegant and transcendent space. A successful modernist interpretation of traditional elements of mosque. Material use and lighting brilliantly employed and detailed in service of the overall concert. Exquisite detailing is clean and strong." 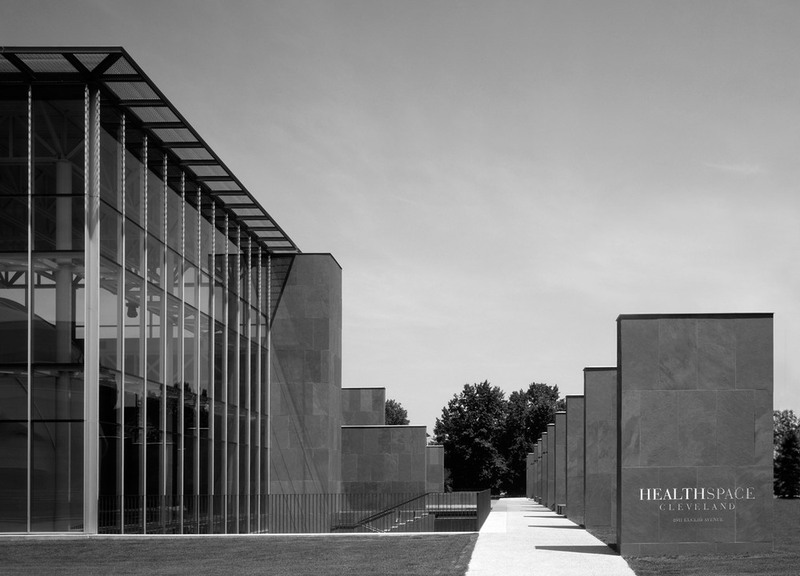 Ralph Johnson, FAIA of Perkins + Will, Jury Chair: "Extremely gratifying to see this level of rigor applied to a retail section within a hospital. 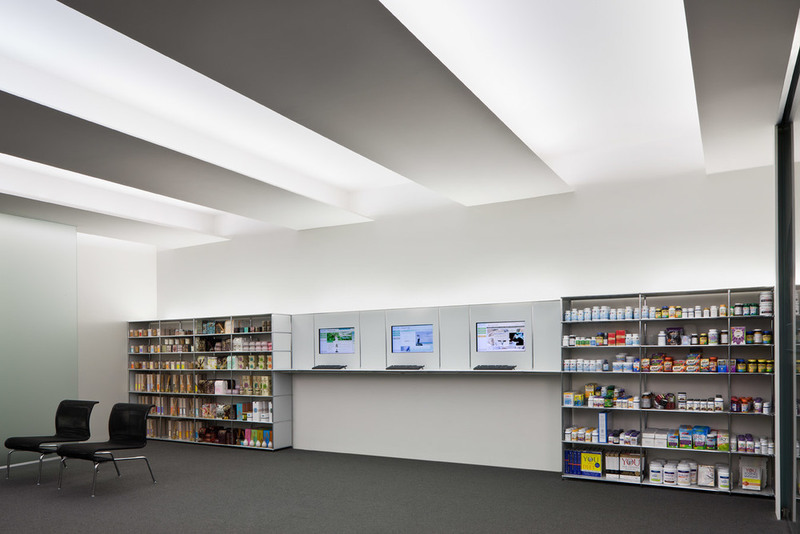 Successful display of product display and architectural space.The lighting and ceiling plane manipulation successfully increases the apparent volume of existing volume." 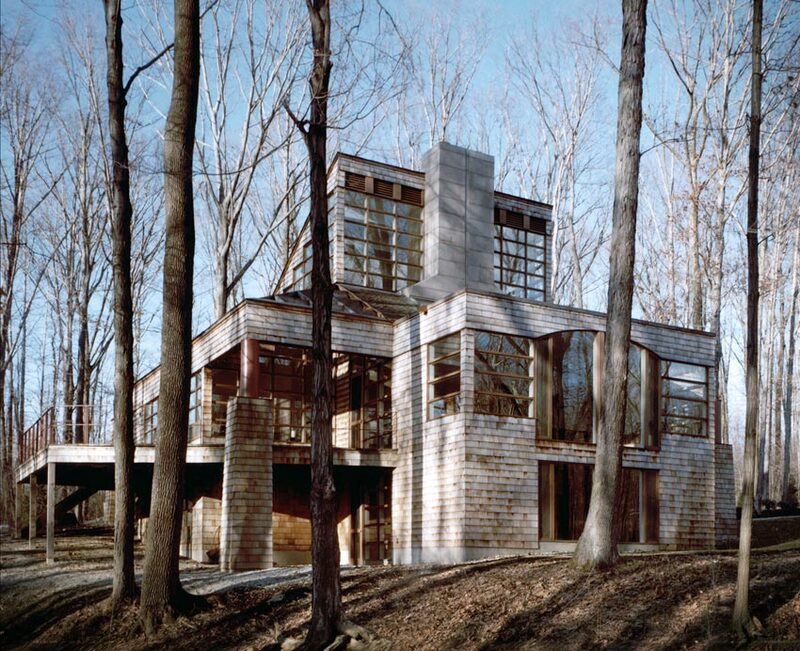 Architects List, "Bucchieri Architects - Deer Run House." Private home for design conscious client. The central art gallery employs a configuration of skylights that provide optimum art illumination and register the solar equinoxes as the indigenous Anasazi once did. Simplicity and elegance in the design convey an understanding of human scale and an appreciation of the art experience. Bob Berkebile FAIA, Jury Chair: "This residence is an elegant modernist form which gracefully embraces the native landscape. The jury compliments the use of native stone and the metaphor of weathering steel columns to represent Peeling Pine Timber. The mass of the native stone and the horizontal composition hugs the landscape and grounds the residence to the earth. This is a beautiful home which has become a part of the desert." A modernist museum of simple geometric forms and repetitive structural elements conforming to a building module expressed throughout. Composed of parallel massive slate walls shifted to form spaces. Between the slate wall planes, the curtain wall is kept transparent with low-iron glass and narrow mullions of maximum spacing. Bob Berkebile FAIA, Jury Chair: "This is a very well executed project which demonstrates maturity in the thoroughness of execution from concept to final building. The 'layering' of walls and planes is effectively used in the making of space and the massing of the facility. The large glass planes made for delightful windows to view and be viewed." Yvonne Szeto, AIA Jury Chair: "The modernist elegance of this museum is likable. It creates an intriguing moment on the Euclid Avenue corridor, without resorting to fussy clichés. The new museum creates a calm simplicity which relates to the adjacent historic building, giving greater power and presence to both structures." Modernist residence with masonry exterior and interior walls and exposed douglas fir beams and decking. The location of the house is a response to the site, soil conditions, the user's needs and energy conservation requirements. The house merges with the terrain and trees yet claims part of the land around it with a clear and direct form. Restoration, adaptive reuse and expansion of the landmark White Mansion administrative offices for the Health Museum. New modern lighting fixture recall the original wall mounted gas lights. New modern office furniture was custom designed to compliment the historic character of the building. Restoration, renovation and expansion including the church, community room and a new glass and concrete exterior elevator and stair enclosure. Simple geometric forms and repetitive window elements determined by the materials selected give order to the design. 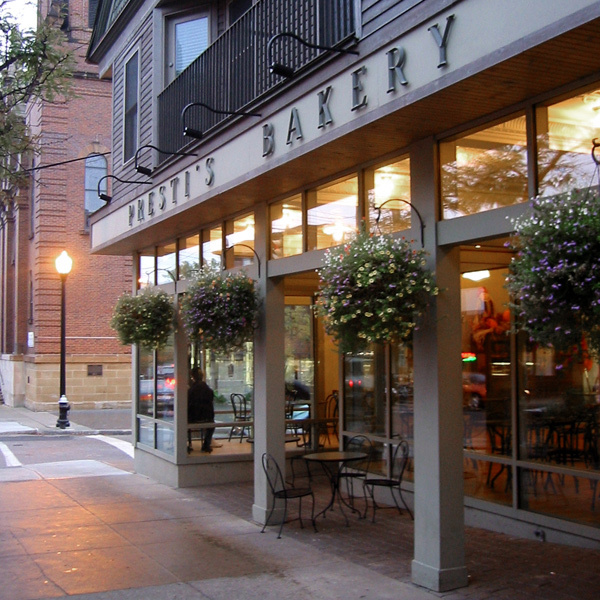 Renovation of retail storefront building into cafe and studios. A residence of modules shifting on a diagonal to create open views to the landscape. The shadows cast in each step between modules convey the movement of the sun through the day. The modules form spaces connected with defined boundaries. The diagonal ridge line of the roof forms an axis linking the spaces of the modules. 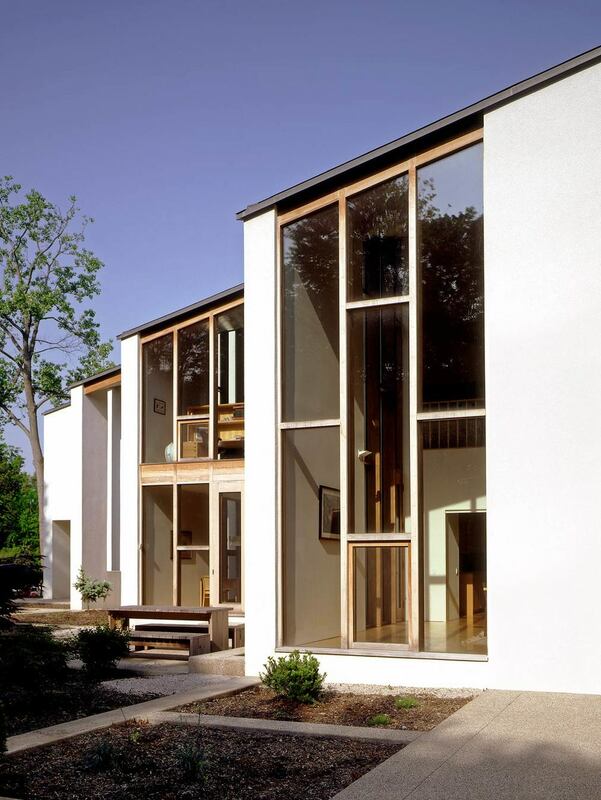 Rodolfo Machado, Associate AIA, Machado and Silvetti Assoc., Inc. Jury Chair: "This unusually interesting contemporary house at times soars with the echoes of religious architecture belonging to the late modern period. His visual sequence passes diagonally from room to room in an intriguing and dynamic manner. The plans are rigorously formed along a strong modular organization that recalls 1960s architectural planning." Three new service facilities and offices. New community recreation center for the City of Cleveland. The design is derived from the building program, the immediate environment and the larger community. The facades project strong, straightforward images with clear functional responses to the building use. The airy, light-filled spaces provide a sense of community. Michael D. Flynn, FAIA, Partner of Pei, Cobb, Freed & Partners, Jury Chair: "a very clean design solution which successfully utilizes materials." Preservation and adaptive reuse of 1916 Cleveland Public School building to residential condominiums. The rural location lead to a design solution influenced by local regional and historic vernacular architecture - from local barn structures to the Shaker Family Meeting House in Mt. 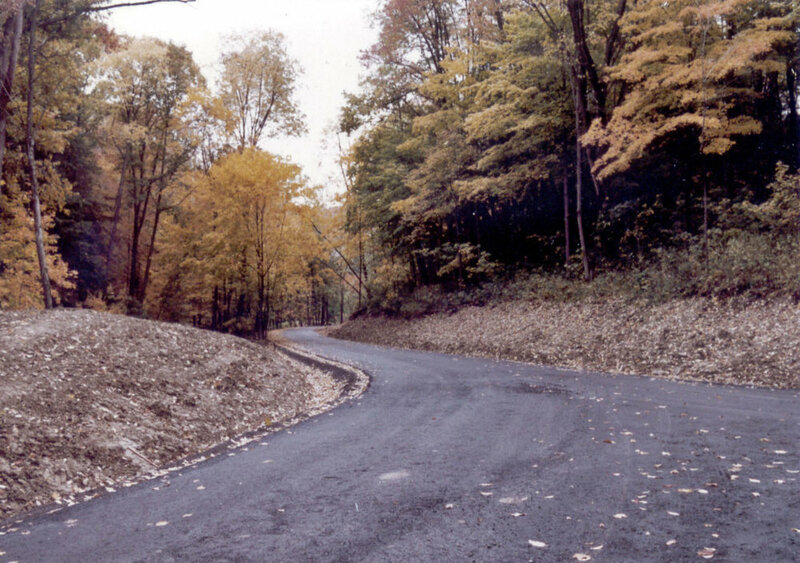 Lebanon, New York. Elements that reflect this influence include the vaulted 'rainbow' roof, the tall narrow windows spaced at regular intervals, the horizontal exterior siding and minimal ornamentation. A tight cluster of elemental shapes - rectangle, cylinder and a colonnade of square columns allows the visitor to see how the structure was put together. Gerhard Kallman, FAIA, Jury Chair: "The library achieved the attributes of a civic structure under Bucchieri's guidance, despite its relatively small size and rather pedestrian location in a commercial and residential neighborhood. The simple, yet 'felicitous inventions' gave the structure grace and stature otherwise defined by its location." 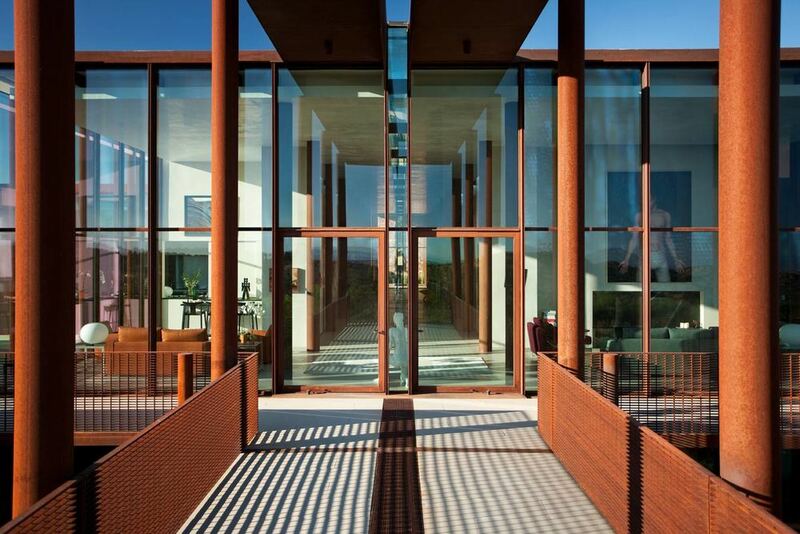 Private residence and art gallery on a five-acre wooded site, designed for a curator of The Cleveland Museum of Art. Architects Society of Ohio AIA Honor Award, 1990; Gerhard Kallman, FAIA Jury Chair: The jury found this solution to be a "very imaginative and unexpected variation of the ubiquitous nine square plan, manipulated and transformed to yield a richness of space and of gabled volumes ... A remarkably successful and lively transformation, taking off from a mathematical premise." Renovation of retail storefront building to sculpture studio and non-profit, public gallery. Vacation home with view of the Atlantic that uses local materials. One additional house and two office-warehouse buildings were completed for this client. Preservation and adaptive reuse of 1909 Cleveland Public School building to art galleries, studios and offices. Renovation and interior and furniture design. The chair is part of a series of designs for the Jacobean revival style mansion. Design is based on the repetition of simple geometric straight lines and flat planes. The house merges with the terrain and the tress with the sloping roof. The shed dormer, wood shingles, stucco, piers and small lites of wood framed windows reflect the bungalow style of the nearby village. The house is composed of two cubes joined on the diagonal with vertical circulation at the junction. The custom redwood windows frame views of a steeply sloping wooded site. Transformation of former service station into an informal, glass enclosed modern atmosphere for a popular neighborhood dining spot. Richard Whitaker, Dean of the College of Architecture at the University of Illinois at Chicago: "an exceptional recycling of a service station, mixing the romance and charm of extensive planting, creative lighting and openness to create a unique place for dining." Exterior materials feature 8 x 8 brick and glass block, while interior walls are 8 x 8 ground face. 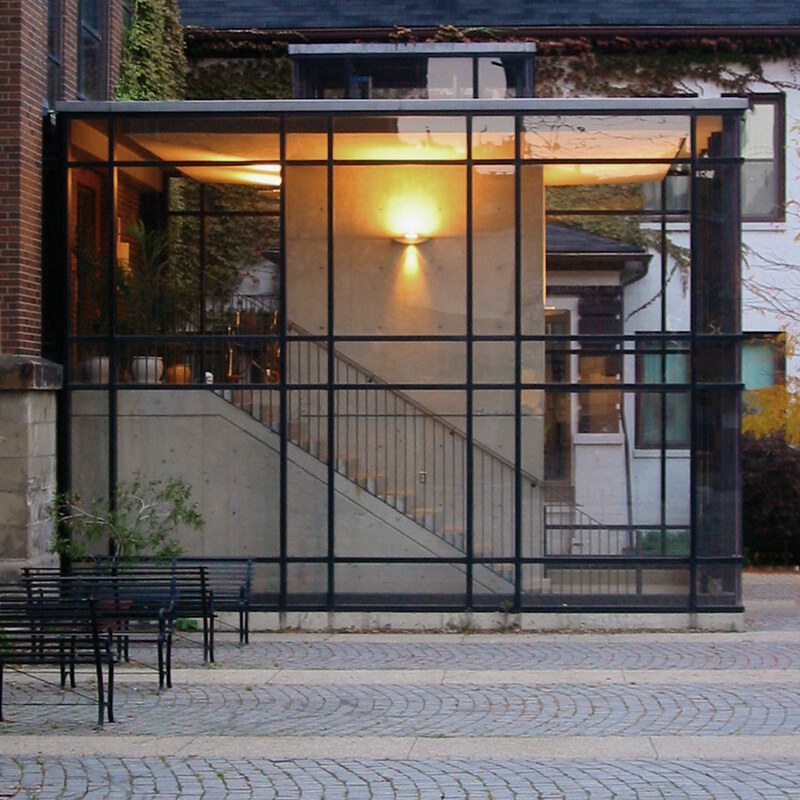 A structural frame on a twelve-foot transverse grid was used to define the living areas within the open space and to free the exterior walls for fenestration.